← FITBUFF BLOG CARNIVAL=Good Stuff! YOUR BIZ CARD NEEDS FENG SHUI! Asian cultures make the simple exchange of a business card into an elaborate ritual that raises the gesture to almost and art form. 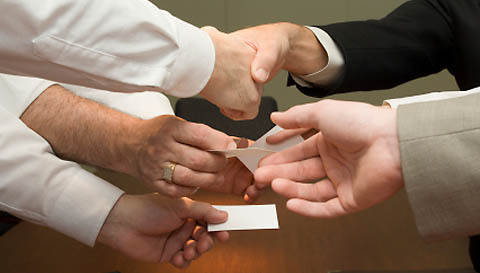 Holding the business card between both hands, taking a bow from the waist, and presenting the card to a new contact in such an elegant manner is their custom. The way it’s done is almost more important than what is on the business card itself. Almost. Your business card is a direct representation of your company and your rank within it. If you are in business for yourself, or, if you also carry a personal card to distribute to new friends you meet socially, you might have more leeway in creating the design of your card. Cards can radiate energy, leaving someone a very positive impression of you and your company. On the other hand, they can also be cluttered and difficult to read. Much like your home or working space, business cards can be improved with feng shui analysis. Cards are usually rectangular in shape and it’s easy to locate the feng shui bagua map on them. Your bottom center area is related to Career, the left bottom corner is Wisdom & Knowledge, go up from there and it’s Family & Health, the upper left corner is Wealth. Center top is Fame, top right is Love & Relationship, below that is Creativity & Future Projects, lower right corner is Travel & Helpful People. Think of these areas while you analyze your current card (and plan your next one). Is your logo well placed for the nature of your product or service? A bank would benefit from having the corporate logo on the upper left side where the Wealth area is located, for example. The upper right side-Love & Relationship– would enhance a wedding planning service or a marriage counselor. Trying to get people to notice you? Front and center will attract fame and reputation. It’s critical not to cram too much info on your biz card. It pays off to give attention to the feng shui of all your marketing materials, especially in this Bear Market. Wow, I’ve never thought of business cards in such a way. Thank you for sharing. I may link to this post on an upcoming blog post. Be my guest re: linking my post to your blog. Thanks!